Thanksgiving Peanut Pie | I made that! Ahhhh…Thanksgiving. I just love Thanksgiving. The whole ritual of spending a whole day (sometimes 2! sometimes 3!) planning and creating a meal to eat with your loved ones, it just makes me glow. Like everyone, I have my traditions, particularly in the pie department. But this year I decided to try something new. 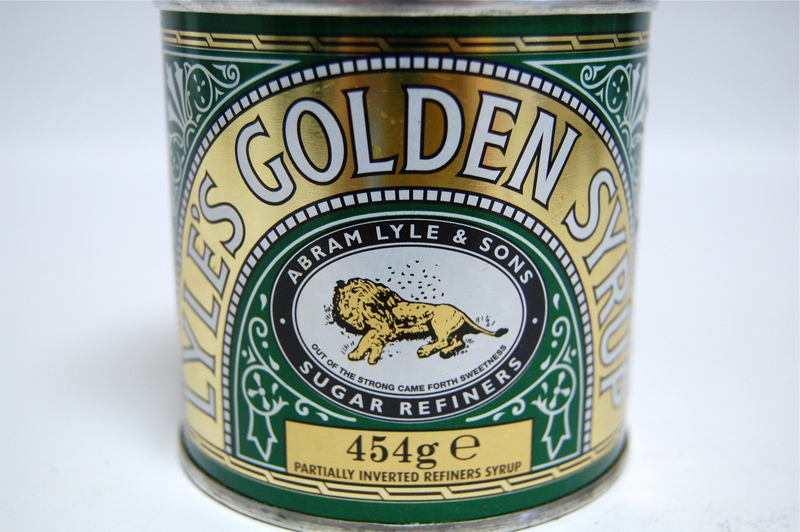 I had bought this can of Lyle’s Golden Syrup ages ago, in a sentimental moment (it was big in Australia). I, of course, never used it because, well, it’s British and I don’t have any British cookbooks. 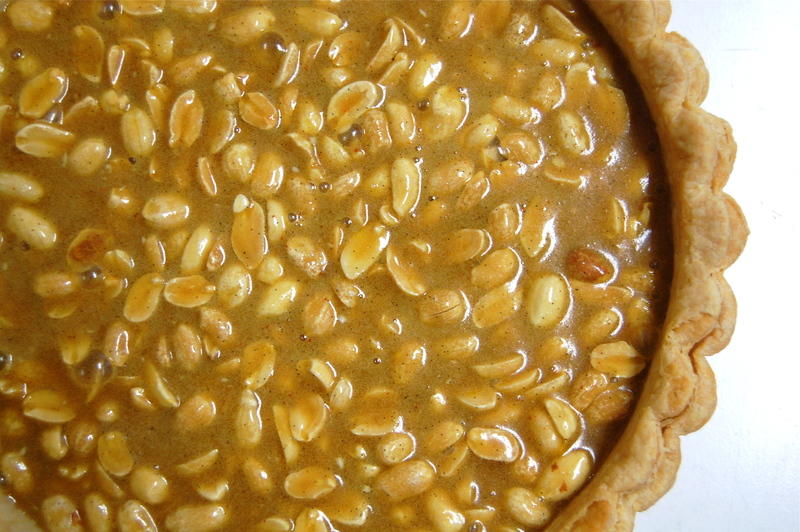 Several years ago a peanut pie recipe caught my eye. I mentally bookmarked it, but never found the right time to make it. It’s funny, I’ll try all kinds of things with cakes, but I tend to get a little rigid with pies. They’re just SO much work! But anyways, this year I decided would be the one, the year I made peanut pie for Thanksgiving instead of pecan pie. It was a bold move. John was terrified since he feels a deep and personal connection with my pecan pie. I almost backed down, until I ran across a recipe for a peanut pie that called for golden syrup. It was basically a sign. So I made it. First I pre-baked a shell. I tossed some dry roasted peanuts inside. Then I made the goo filling, which I poured on top of the nuts. And then I baked it for 45 minutes or so, until it was set in the middle. To be honest, I wasn’t totally in love with this pie. It kind of tasted like a Baby Ruth candy bar. After years of oohing and aahing at the idea of peanut pie, I had some serious expectations. But in the end, I had a hard time fighting off the “I’d rather be eating my pecan pie” feelings. But then again, I make a mean pecan pie. – Rub seeds from vanilla bean into brown sugar to break up clumps. – Whisk brown sugar, flour, 1/2 teaspoon coarse salt, cinnamon, and cayenne in medium bowl. – Whisk eggs in another medium bowl to blend. – Add brown sugar mixture to eggs. – Add golden syrup, apple cider vinegar and melted butter to eggs and whisk to blend. 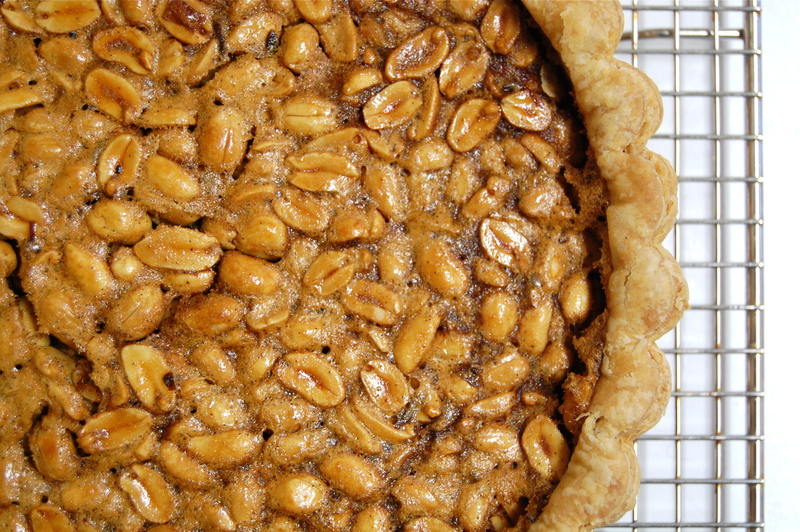 – Pour peanuts in pie crust. Pour in filling. 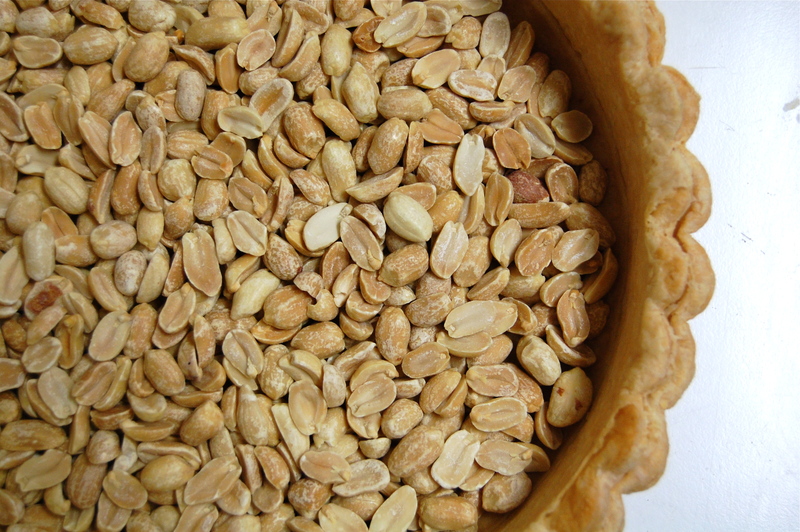 – Bake pie until filling is set, about 40 minutes. What you might possibly feel is a more successful pairing of peanuts and golden syrup (and it’s certainly quicker than a pie): spread a nice piece of bread or toast with some good peanut butter; drizzle with golden syrup. eat, then lick your fingers (you’ll need to). ps. this assumes you are using peanut butter made only of peanuts and possibly salt – not apple juice, high glucose corn syrup, palm oil, etc etc – in the case of the latter, I assume no responsibility for the outcome 😉 ). when we moved to north carolina i came across this pie for the very first time and thought it was perfect from the very first bite! can’t wait to try your recipe!